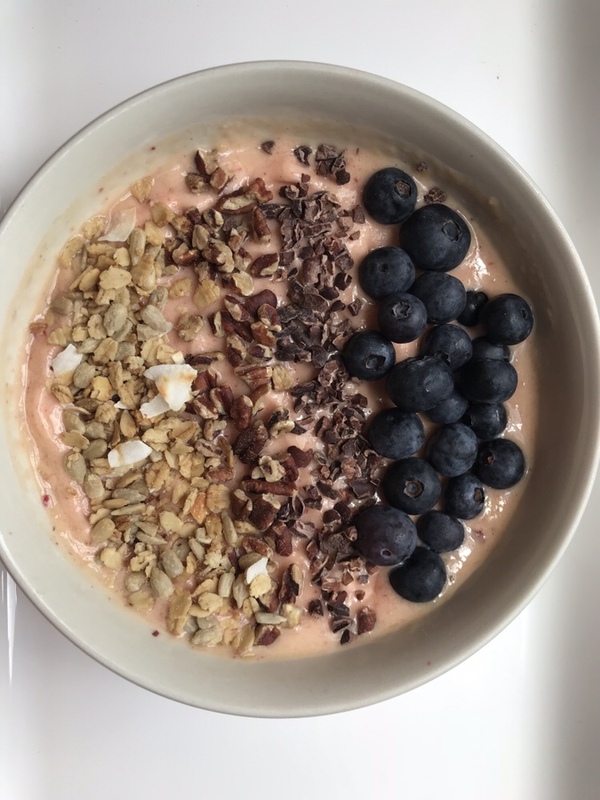 I won’t lie, whenever I see smoothie bowls online I am always envious because they also look delicious and perfectly put together. I don’t know about you, but fruit doesn’t keep me very full so it’s something I typically pair with something else. I may have berries in my oats or a banana with my protein shake. I top yogurt with fruit and nuts sometimes. But on it’s own I could eat a ton of fruit and not be full for long. However, since March we’ve been consuming a ridiculous amount of fruit that has led to the purchase of large bags of frozen mixed fruit. It lasts longer than fresh fruit and it’s perfect for in yogurt and smoothies. I do buy fresh, don’t get me wrong, I LOVE crisp fruit, but honestly guys, read the labels. Frozen fruit is just as nutritionally dense as fresh and you can find bags that have NO additives, which makes it a pretty economic choice when some fruits aren’t in season. What brought me to this recipe is the search for a snack while lunch was cooking. For me this was an appetizer to baked chicken. I was running low on veggies and was trying to figure out a carb to have with lunch. I then realized that I could just have lunch in parts and call it a meal. 1. 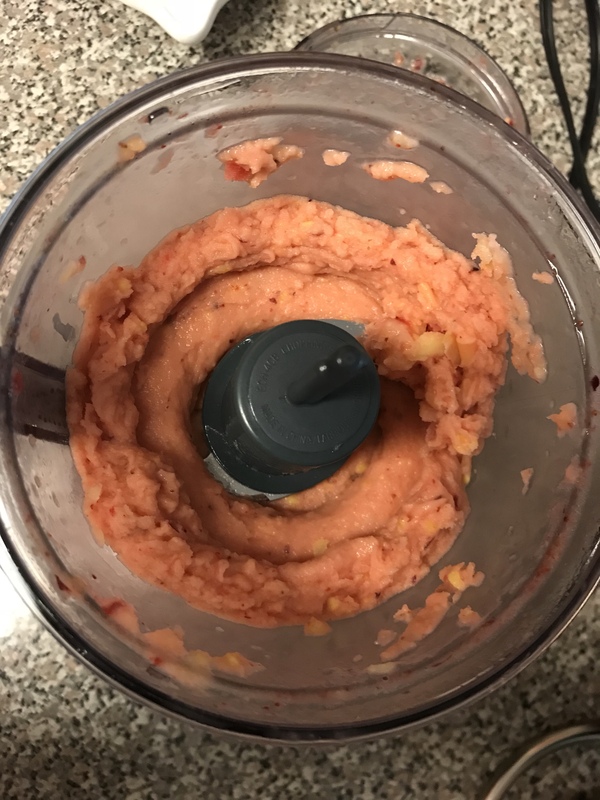 In a food processor, grind/chop 1 cup of frozen fruit for a few minutes. You’re going to want to pulse the fruit as it start to chop. 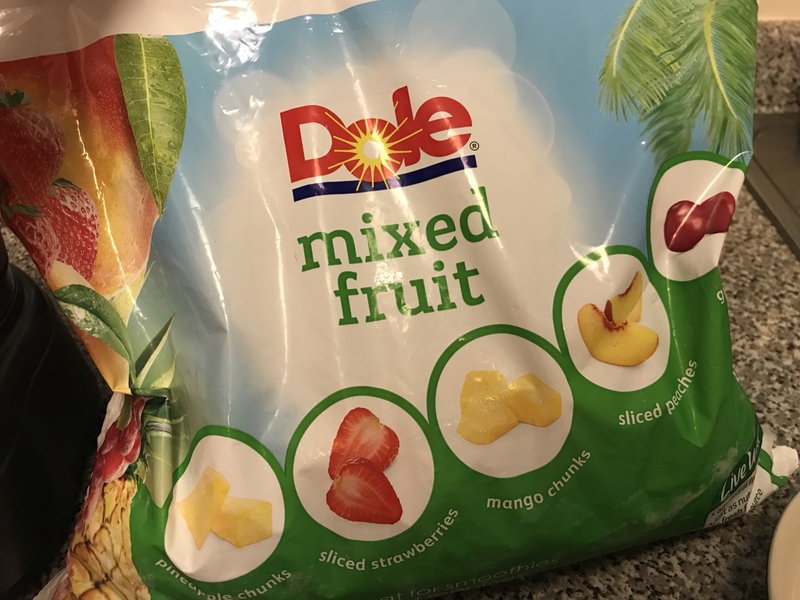 I used mixed fruit from Dole that I got a sale a few weeks ago. *Using a few fruits gives a good base of flavor and textured. 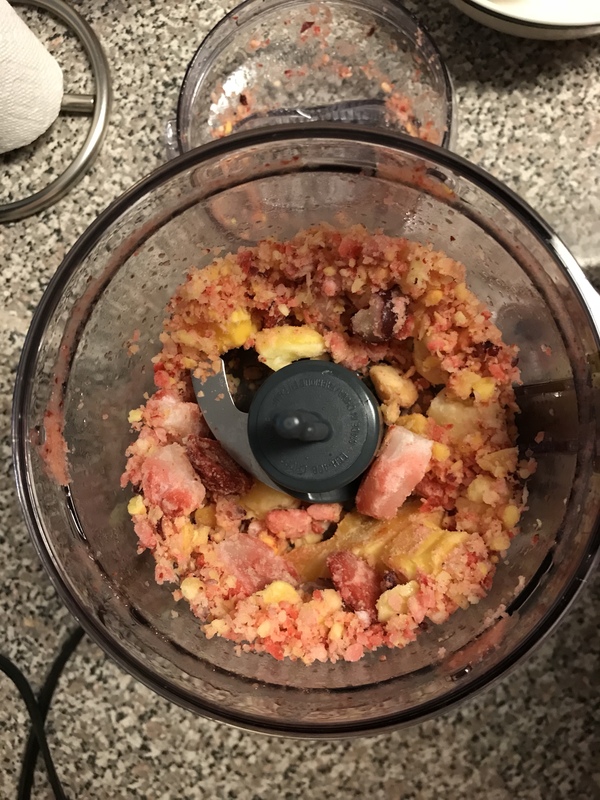 You could combine bananas, strawberries, blueberries, etc. if you don’t have a pre-bought bag. 2. Add a 1/4 cup of milk or milk alternative to the chopped fruit. 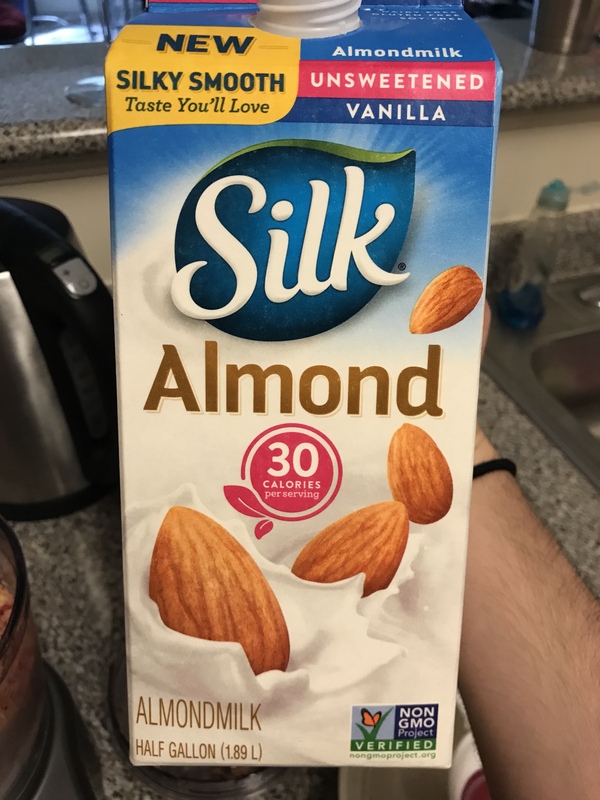 I used almond milk. After blending in milk, consistency should be thick like frozen yogurt. 3. 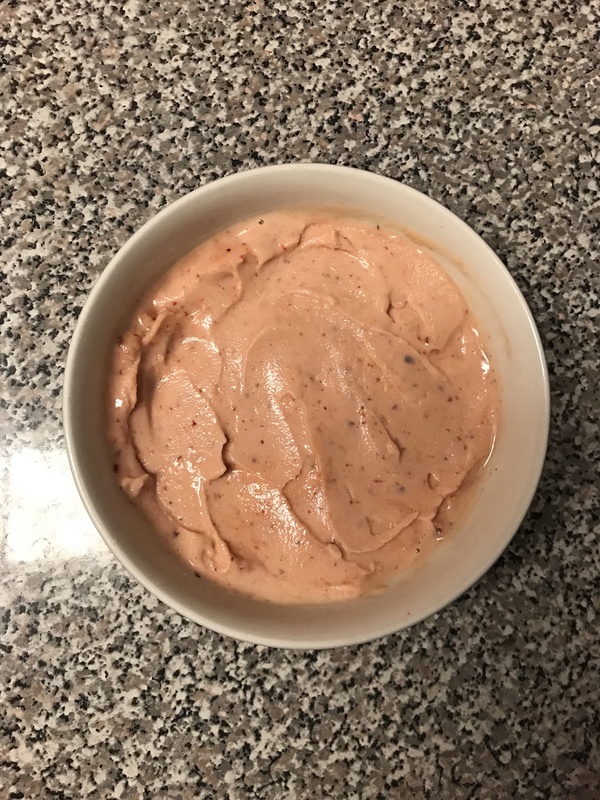 Add 1-2 tablespoons of whey casein protein powder. 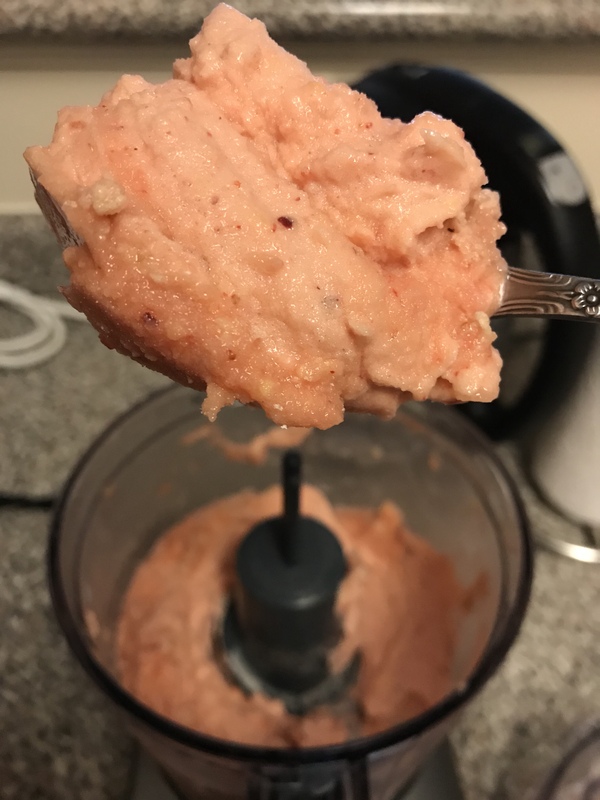 I added 1 tablespoon, which is about 1/4 scoop of protein powder. The more protein you add, the thicker it’ll be and you may need to add a little more milk. If you’re using whey isolate it may not be as thick as whey casein blend. If you’re using a vegan or plant based protein, I’m unsure how thickness will be impacted. 4. Transfer fruit base to a bowl and level out. 5. Optional: Top with your favorite toppings. The fruit base will have a lot of flavor so you can eat it on its own or you can jazz it up with toppings. * Be mindful of you’re toppings and what they add nutritionally and calorically. 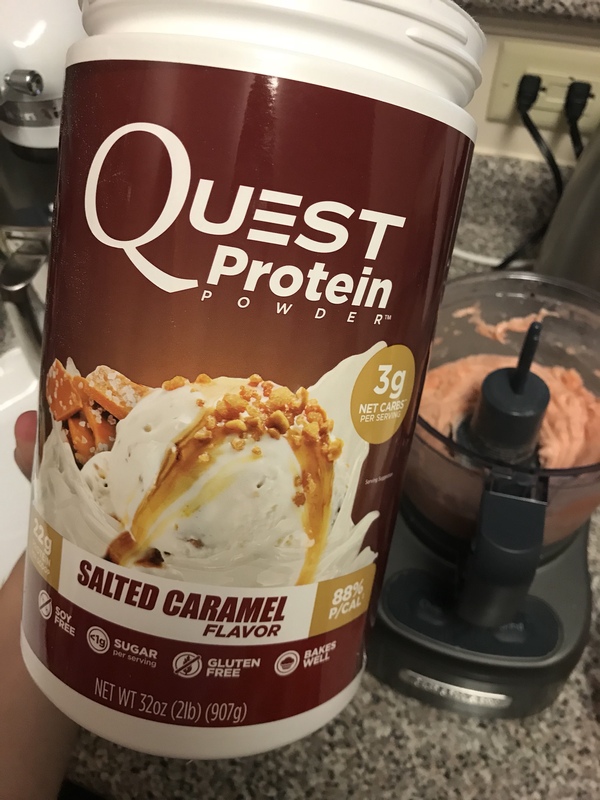 This base is a moderate carbohydrates base with 5-12g of protein depending on how much protein and brand (1 or 2 tablespoons) you added. Nuts/seeds/nut butter will add fat and some protein; fruit will add more carbs; coconut will add fat and carbs, etc.